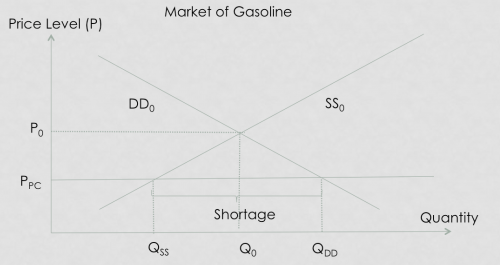 In our previous article discussing about price floor, the rationale of price ceiling is fairly similar to price floor – the government deems that the equilibrium price determined in the market is way too high and decides to keep an “artificial lid” below the equilibrium price P0 at Ppc. The word ceiling literally means nothing can proceed “beyond” it! Price is kept artificially low, reduces inflation. 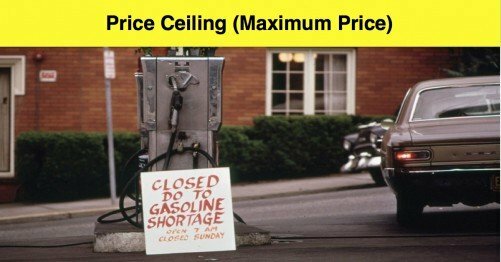 If the implementation of the price ceiling is not strict, this creates a potential black market for gasoline, where gas producers would deliberately horde gas production and charge an exorbitant price to “extort” the consumers who needs gasoline urgently in underground black market..